Excerpt: As of the last full year end for the 3,678 companies in the PacificData database, there were 4,267 Independent Directors or 10.6% of the total number of Directors. 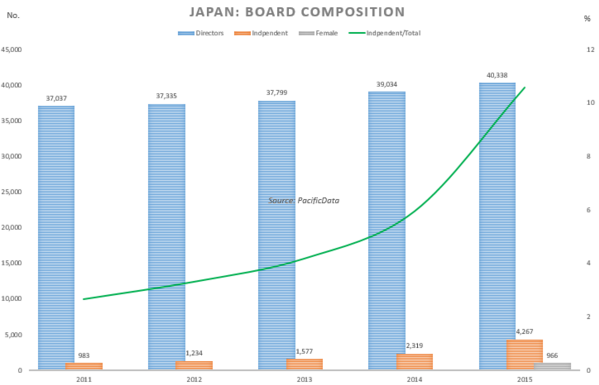 The total number of female Directors was just 966 or 2.4% of the total – well below even the 9.5% ratio of female members of Japan’s House of Representatives. The number of Independents has quadrupled over the last four years which is welcome but will have to triple from here to reach the 33% suggested number. A number of companies already have a majority of Independents and these are awarded our “Gold Star”. Kudos to Japan Exchange, Japan Post and Japan Post Insurance for setting a good example. In our ‘sin-bin’ are the 1,136 with no Independents. The largest of these by market capitalization are as listed below. The data will change significantly after this year’s Annual General Meetings, when many companies plan to add independent directors for the first time or increase the current number to two or more.